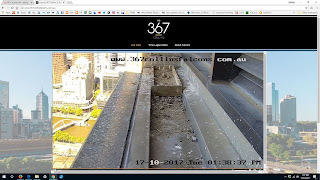 The two falcon chicks escaped their wooden box into the metal gutter where the box sits. 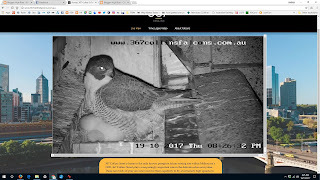 I took a screen grab on Tuesday and both chicks were far from the box. I later saw a video where someone had grabbed some footage and both chicks were being fed. Wednesday morning when I checked, one seemed to be dead to me, but sometimes they just like sleeping. By Wednesday night I was convinced one chick had died and it has. It is odd that I haven't seen any mention of this, especially on Twitter. We had a couple of hot days, and in spite of me seeing a parent shading the chicks, perhaps one succumbed to the sudden heat. The other seems fine. I saw it gazing around skywards, looking for a parent returning with food and comfort. The weather is cooler now, and the surviving chick is back in the wooden box. Well, that is a bit sad. I doubt anyone will interfere and remove the dead chick. It is as nature happens. Falcons have been nesting in the same spot for many years, although I read somewhere that they didn't for a couple of years after a falcon fed illegally poisoned pigeon meat to the chicks. The surviving chick will get more food and probably thrive. Sad that one has died and I agree it was probably the sudden hot spell. I noticed Pat's budgie, Mitchell was a bit lethargic for the three hot days we had, then today he was as perky as always. River, rather like hot weather affects me. I hate that one died. Babies in the wild are always at risk. Sandra, indeed they are, even if it is man made wild environment. Hopefully the surviving chick will do well and thrive with more food as you say. Sami, I wonder how they get liquid? Parental saliva? Moisture from the meat? It is the way of things but not easy to accept. I hate watching those nature programmes when an animal is in danger. I desperately want the cameraman to interfere. Marie, I know what you mean. Worse if it is a human tragedy and the cameraman does nothing. Definitely sad. I suspect you are right and the surviving chick will thrive on extra food and attention. I hope you are right. EC, it is often the way that the stronger chick will fight for more food. Perhaps it is written in Darwin's scheme. 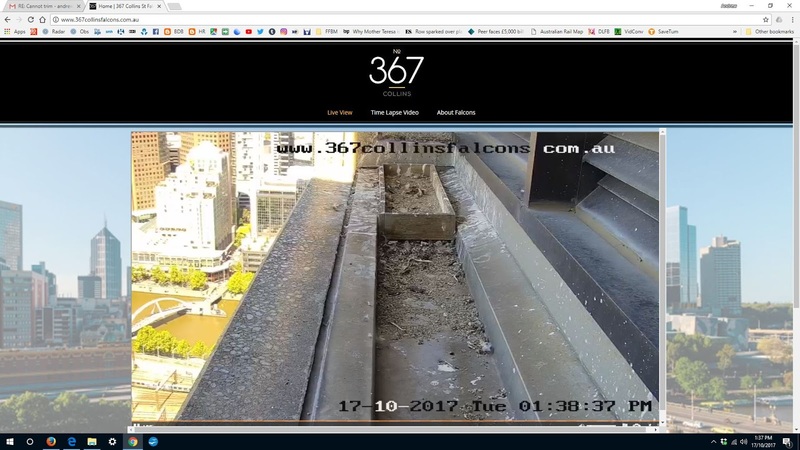 It's difficult to watch those bird live cams sometimes. I figure the two kittens left with the mom cat I just got fixed and returned, will have a better chance since I at least trapped two of her four kittens. Strayer, I am quite sure you will get them all. You always do.